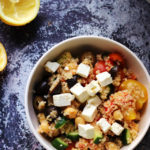 A cozy one pan creamy feta, tomato, and chickpea Israeli couscous casserole – the perfect comfort food for spring! This is like bowl food meets baked ziti meets SPRING!!! Except without ziti or pounds of cheese or, errrm, a bowl. (PS: THIS IS WHAT HAPPENS WHEN YOU PLAY DISNEY PRINCESS CANDYLAND TWELVE TIMES A DAY. Your mind turns to complete and utter absolute mush. So, yeah. Remy is obsessed with that game and I think we literally played it once an hour yesterday. It’s teaching her how to take turns and play fair and not be a sore loser and all that good stuff, but it’s also basically a torture device. Pretty reliably you’ll be one move away from winning and then you’ll pull a picture card that sends you back to the beginning of the board. Like, it happens at least once a game. Sometimes three times. Annnnnndddd that basically sums up life with a toddler. So if I never make any sense again, now you’ll know why! Anyway, this casserole. It’s so lovely for this transitional time of year when half the country is in spring, half is still getting two feet of snow, and no one knows what the season is anymore. It has a lot of bright fresh flavors (cherry tomatoes! lemon! fresh herbs!) 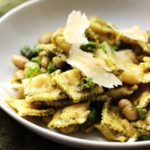 that make it taste like spring, but it’s also baked with a blanketing of cheesy creamy comfort on top of a bed of carbs. 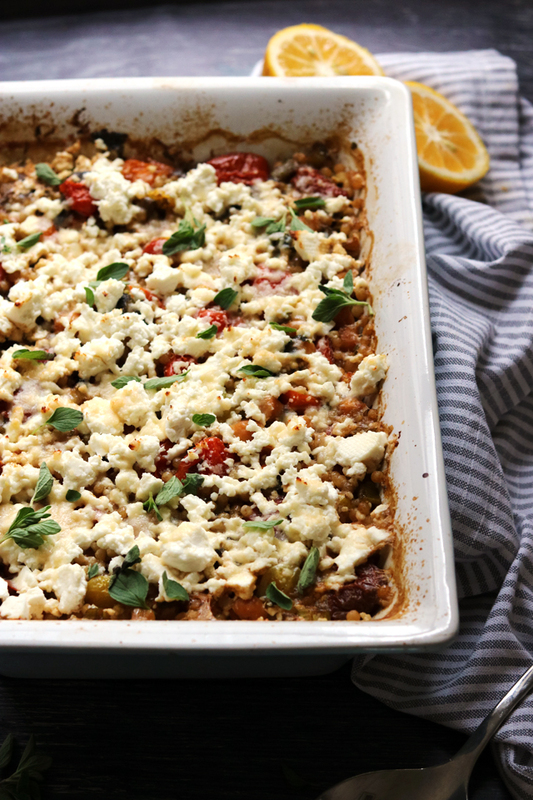 If you’re looking for a make-ahead (vegetarian) casserole for Easter (or any other spring celebration), this would be perfect. 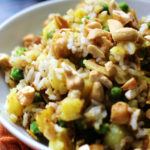 Eat it as a main dish or serve it as a side, depending on your menu needs. 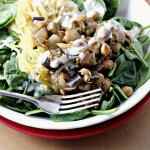 Or just have it on hand for quick weeknight dinners, as we do. 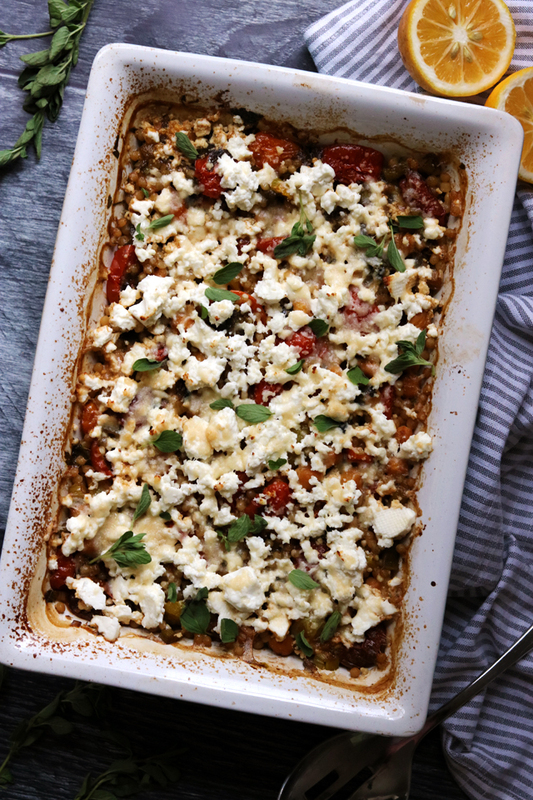 A cozy one pan creamy feta, tomato, and chickpea Israeli couscous casserole - the perfect comfort food for spring! 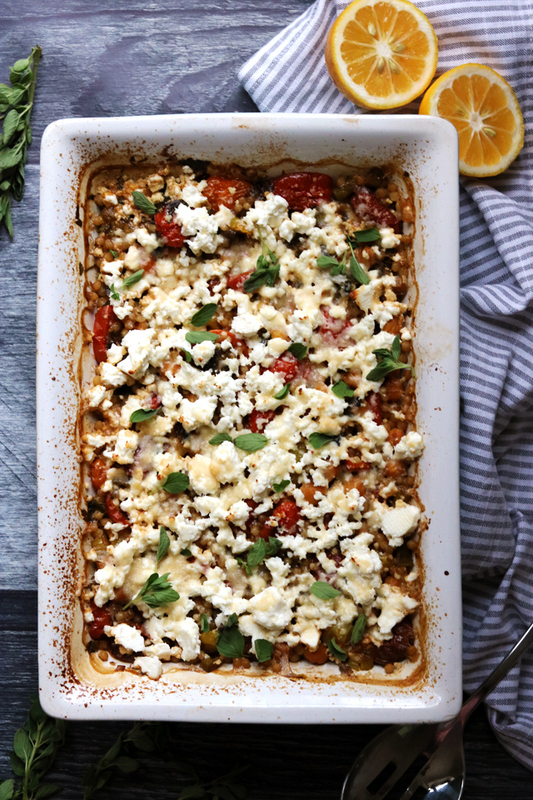 In a 9-inch baking pan or gratin dish, toss together the tomatoes, scallions, olive oil, vinegar, garlic, ½ tsp salt, black pepper, and oregano sprigs. Roast until the tomatoes are caramelized and tender, about 15 minutes. Meanwhile, heat the vegetable broth with the remaining tsp salt until boiling. Stir in the parsley, lemon zest, and cumin. Remove the pan with the tomatoes from the oven. Remove the oregano sprigs. Stir in the couscous, chickpeas, and hot broth mixture. Cover tightly with aluminum foil and return to the oven. Bake for 20 minutes. Remove the foil and top with the feta and parmesan. Return to the oven and bake for another 5 minutes or until the cheese starts to melt and brown. It’s beautiful! And Candyland is hated by my kids for the same reason you dislike it. I remember the Candyland days! My kids loved playing it too. Don’t worry – the board games we get to play now (when your kids are teenagers) are way more fun! The casserole looks healthy, hearty, and delicious! 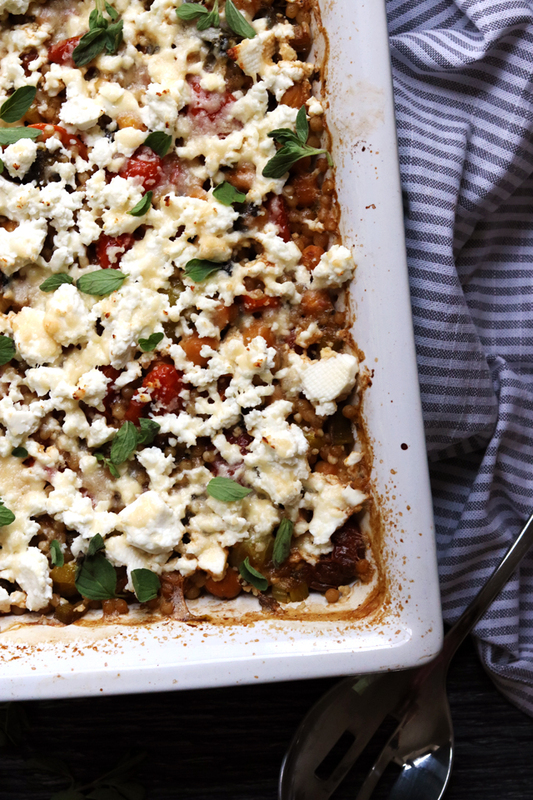 Love all that feta on there.